Wadsworth, IL – March 17, 2014 - Meagan Murray and Buena Vista Farm were lucky enough to escape some of Chicago’s frigid temps for a few weeks to compete at the Winter Equestrian Festival in Wellington, FL. Unfortunately, a bit of the bad weather followed them and rained out their first show day, and of course, after all the horses were braided, shipped over to the show and ready to go! The good news is, despite the wet start, the farm was able to bring home some fantastic prizes. Week 7 was the highlight for Buena Vista, whose riders earned three Reserve Championships. Cathy Rolfs of Chicago rode her way to the Modified Adult Jumper Reserve Championship aboard Sorin, winning one of the classes in the division. "Sorin or "Brady" is a blast to ride," said Rolfs. "He's only about 15.2h but loves his job and is really fast and careful. He is feisty and can be a little opinionated at times, but the second he goes in the ring and starts jumping he always wants to be the winner." Rolfs works in Chicago at a tax consulting firm so she doesn't get to ride as often as she did while attending school. 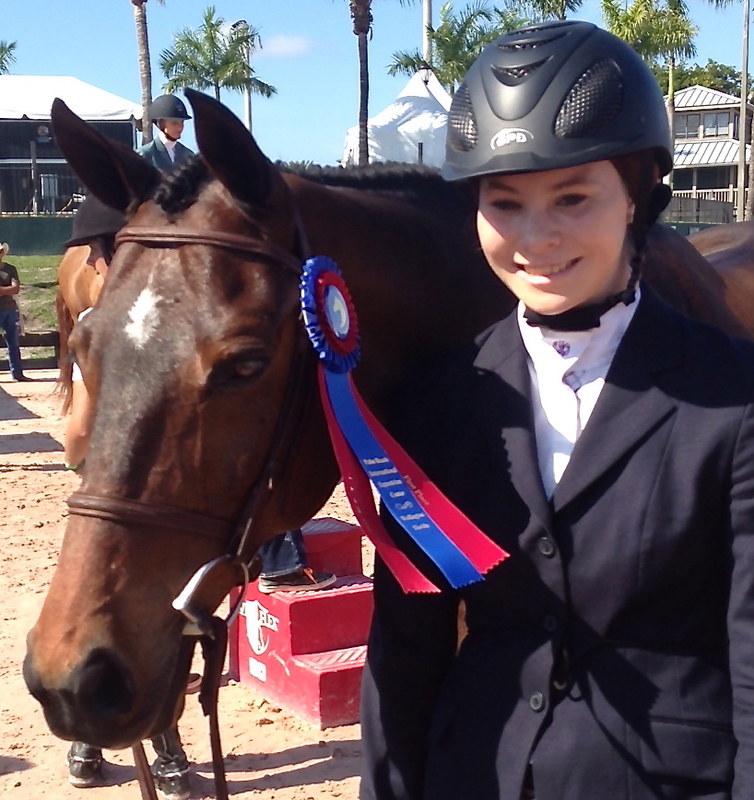 "Just getting to go down to WEF for a couple weekends and doing well was definitely a highlight," added Rolfs. Emily Ablin and On the Hour, owned by Leeann Ablin of Highland Park, took home the Reserve Championship in the Small Junior Hunters 16-17 after winning the Stake class. Murray rode the horse in the Performance Working Hunters 3’6” and earned some top ribbons as well. Emily Ablin and On The Hour brought home the Small Junior Hunter 16-17 Reserve Championship. "I got On The Hour (aka "Scottie") after he competed at the National Horse Show in October (2013)," explained Ablin. "I absolutely love riding Scottie. He is especially fun because you can just get on a forward rhythm and keep it throughout the course. He's really sweet, and he's kind of funny because he sort of walks around like he knows he's awesome." Murray also piloted Well Versed for the Ablins to the Green Conformation Reserve Championship. Murray won a class, won two seconds and placed third in the Stake class. Ablin also rode the horse in the Large Junior Working Hunters 16-17, winning top ribbons on the handsome mount. "That was my first show with Well Versed, who we had gotten that Tuesday!" exclaimed Ablin. "Well Versed is so different from Scottie. First of all, he's so much bigger so you can't just get on a nice forward rhythm, you have to maintain his big step! But they both jump amazing, and Well Versed is also an especially nice mover. I'm really excited about our shows together in the future and I think we'll have some more great results!" Ablin had another ride, Esperado, a ten-year-old Belgian Warmblood that showed in the older Large Junior Hunter section too. The pair collected some top ribbons in the division as well. Carol Rolfs showed the Oldenburg gelding, Lovely, placing in the top spots in the Adult Amateur Working Hunters 51 and over. Buena Vista Farm and Meagan Murray would also like to congratulate Becky Price on the purchase of their new six-year-old stallion. The new horse will show in the First Year Green Working Hunter division. Currently the horse’s nickname is Hippo, his show name has not been decided on yet. Buena Vista Farm will head to the Kentucky Spring Horse Shows in May and Showplace Productions’ Spring Spectacular in June. Murray won a coveted prize in the 2013 USHJA International Hunter Derby Finals in Lexington, KY finishing 10th overall in the Tier II section and 16th overall in the derby aboard Jenna Selati’s Fidelia. Murray competes at the national A and AA horse shows and has quality sale horses as well. She was awarded the USHJA Emerging Professional Award in 2011. Their facility, located at 41900 N. Delaney Road in Wadsworth, offers a heated 100 x 280 indoor arena, a 150 x 275 outdoor arena with all weather footing, 12 x 12 matted stalls, all weather paddocks, pastures, a treadmill, Euro hot walker, full service grooming and a luxurious club room. For more information on Buena Vista Farm, please visitwww.buenavistaequine.com.